Three Chinese astronauts, led by a veteran of a previous space mission, soared into orbit Tuesday to begin a 15-day voyage to China's Tiangong 1 space lab, a flight officials say will further prove the capabilities of the country's manned space program. 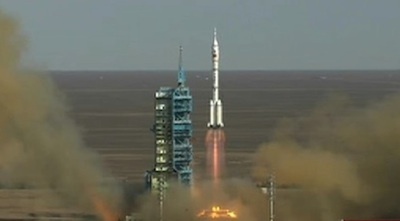 The 191-foot-tall Long March 2F rocket, powered by 1.4 million pounds of thrust, lifted off at 0938 GMT (5:38 a.m. EDT; 5:38 p.m. Beijing time) from the Jiuquan space base in northwest China's Inner Mongolia autonomous region. Less than 10 minutes later, after a dazzling launch broadcast on Chinese state television, the 8.5-ton Shenzhou 10 capsule arrived in orbit. A few moments later, the spacecraft extended its two solar array wings to generate electricity. Later Tuesday, ground controllers planned to command the craft's thrusters to fire, placing Shenzhou 10 in a circular orbit nearly matching the trajectory of Tiangong 1, which circles Earth at an altitude of about 210 miles at an orbital inclination of 42.8 degrees. "The Shenzhou 10 spacecraft has entered its orbit," said Zhang Youxia, chief commander of the China Manned Space Engineering Office. "The crew are in a fine state. I announce the launch of the Shenzhou 10 spacecraft [as] successful." Chinese President Xi Jingping witnessed the launch at Jiuquan and addressed the astronauts before they boarded the spacecraft. "You will be embarking on the fifth manned space mission of China," Xi told the crew. "This carries the space dream of the Chinese nation. It will also show the Chinese passion to reach for the stars and reach into space." Shenzhou 10 is scheduled to reach the Tiangong 1 module Thursday. The two vehicles will form a complex more than 60 feet long after the link-up in space. The astronauts, commanded by Nie Haisheng, a 48-year-old general in the People's Liberation Army, will duplicate docking feats accomplished by last year's Shenzhou 9 mission. 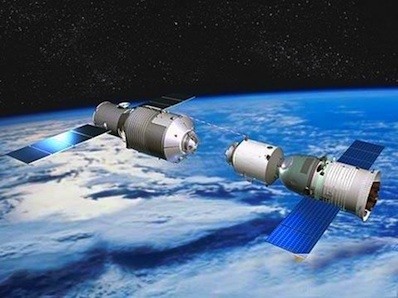 But Shenzhou 10 will pave new ground in experimentation and pioneer another type of rendezvous with Tiangong 1. China's manned space program, which has proceeded at a deliberate pace since the first astronaut flight in 2003, is preparing for the construction of a 200-ton Mir-class space station in Earth orbit by 2020. "The [Shenzhou 10] spaceship will carry out one auto rendezvous and docking and one astronaut manual rendezvous and docking according to the scheduled procedure," said Wu Ping, officials spokesperson for China's military-run manned space program. "During the flight of the complex, astronauts will enter and stay in Tiangong 1, conduct space medicine experiments, technology experiments and space class activities, etc. After the flight of the complex, the spaceship will retreat and return to the landing site, while Tiangong 1 will maneuver to [a] long-term operation orbit." Shenzhou 10 will be China's longest-duration spaceflight to date, eclipsing a 13-day mark set by Shenzhou 9 last year. Engineers also consider the Shenzhou 10 mission an operational flight. "It is like developing a new type of car. You have to try it on roads of different conditions. Now trials are over and the car can be put into formal operation," said Zhou Jianping, chief engineer of China's manned space program, in a report published by the official Xinhua news agency. Sitting in the center seat of the Shenzhou 10 capsule, Nie will oversee the automated and manual dockings with Tiangong 1. Zhang Xiaoguang, a 47-year-old Air Force pilot, will assist with Nie flying the spacecraft. Wang Yaping, a 33-year-old Chinese military officer, is China's second female astronaut. She is in charge of medical duties and will conduct a lecture with Chinese students in a live broadcast from Tiangong 1 - an event not featured in earlier Shenzhou flights. "I'll demonstrate some physics experiments done in the space environment," Wang said in a broadcast on China's state-owned CCTV television network. "As an astronaut, I'm also a learner, like those students. I think we'll learn together and have a great time in space." After hosting the Shenzhou 9 and Shenzhou 10 spacecraft, Tiangong 1 will be put in a new orbit to continue testing. Launched in September 2011 and designed for a two-year lifetime, Tiangong 1 will be replaced by a larger space laboratory named Tiangong 2 designed to house three astronauts for 20 days. Tiangong means "heavenly palace" in Chinese. Shenzhou translates to English as "divine craft." The gradual progress of China's manned space program is in contrast with the feverish advances made by U.S. and Soviet engineers in the Space Race of the 1960s. Chinese leaders have stated the program's goal is to deploy a Mir-class space station in orbit by the end of the decade, with regular visits by crew capsules and resupply freighters. China is working on larger Long March rockets to loft the massive modules required to construct the space station. China is not a member of the International Space Station project, a $100 billion, 450-ton complex in orbit with participation by the United States, Russia, Europe, Japan and Canada.